Gjendebu is well located at the innermost end of Lake Gjende, in the heart of the Jotunheimen. It’s DNT’s oldest tourist lodge, built in 1871. Since then, it has been extended and rebuilt several times. Today it has 119 beds and relatively modern facilities. by peaks and glaciers in all directions. In summer there’s a daily bus connection from Oslo and Otta to Gjendesheim. By car you can drive to Gjendesheim either via Otta or Sjoa to Randsverk and further onward, or via Fagernes-Beitostølen over Valdresflya and on to Gjendesheim. By train from Trondheim or Oslo to Otta, and then by the daily bus. There’s a daily boat route from Gjendesheim to Gjendebu. 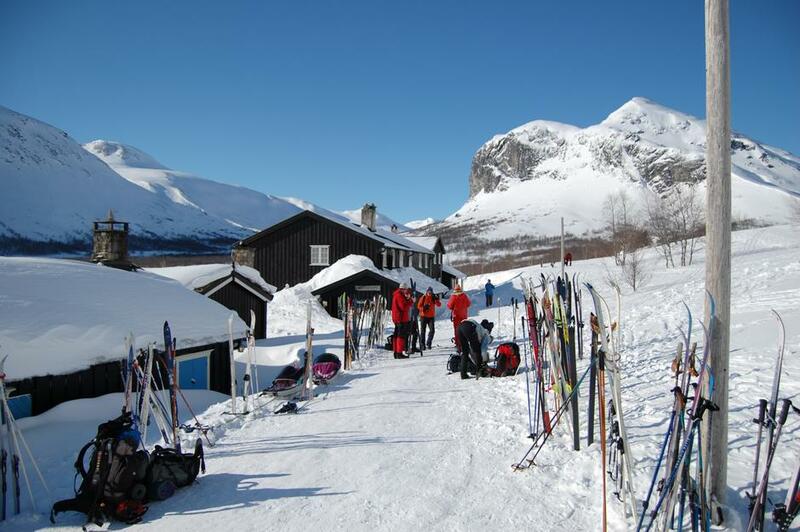 In winter, the route is the same as to Gjendesheim, and then onward on frozen Lake Gjende. At Easter there’s scheduled bus service to Gjendesheim. Further details at www.gjendesheim.no. The road from Randsverk is open all the way to Gjedesheim. But the road over Valdresflya from Beitostølen is closed in winter; it opens about 15 April. An alternative route is via tracked vehicle to Fondsbu and from there ski 15 km to Gjendebu. Take the bus to Gjendesheim and boat from Gjendesheim to Gjendebu. There are express buses and local buses to Gjendesheim during the summer season. The timetables vary slightly. Find your departure and route by visiting Entur or click here for more information about mountain buses. Gjendebu is a staffed lodge at Easter and in summer, mid June to mid September. Otherwise during the year it’s a self-service cabin, locked with the DNT cabin key. The lodge has 119 beds. Rooms of good standard. Showers and toilets in a newly refurbished dormitory. The cabin is not handicap adapted but is easily accessible by boat from Gjendesheim. Short trail from the boat dock to the cabin. Accommodations may be reserved online at www.gjendebu.no or by E-Mail to gjendebu@turistforeningen.no. But there is always room in the DNT cabins.